By becoming devotee of Lord Krishna one will be glorious within the whole world and can purify his 100 generations of forefathers, his own father and mother including his relatives also. In the scriptures, we can see how the first living entity of this universe is a devotee of Lord Krishna i.e. Lord Brahma ,then his son Narada Muni and Vasistha Muni were Krishna’s devotees, Vasistha Muni’s son Parasar muni was Krishna’s devotee and his son Vyasadeva was Lord Krishna’s devotee, then his son Sukadeva maharaj was also Krishna’s devotee. All of the above personalities are most glorious in the three worlds. The son of the great King Uttanapada, Dhruva Maharaj was Krishna’s devotee. Even the son of the great demon Hiranyakasipu, Prahalada maharaj was a devotee of Lord Krishna. Becoming a devotee of Lord Krishna and preaching His message is the greatest humanitarian work, thats why Krishna says in Bhagavad-gita (18.68-69), “One who explains this supreme secret to the devotees, pure devotional service is guaranteed, and at the end he will come back to Me. There is no servant in this world more dear to Me than he, nor will there ever be one more dear”. 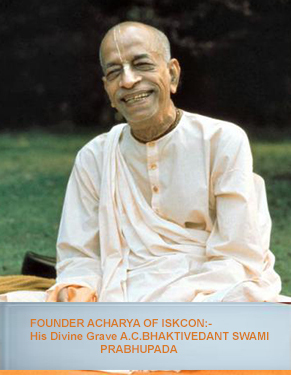 We can see how the founder acharya of ISKCON His Divine Grace A.C. Bhaktivedanta Swami is glorious in the world.We humbly request to every one to become a dedicated and sincere devotee of Lord Krishna. Just dedicate your self for spreading the original message of Srila Prabhupada and Sri Chaitanya Mahaprabhu, part time or full time and you will definitely go back to home, back to Godhead.